Bluefin heads to New York City this month for Toy Fair 2018 with a variety of new and notable products from the Bandai Shokugan brand including Mighty Morphin Power Rangers. A recent press release by Bluefin, the official Tamashii Nations distributor in the United States, provided further details on the upcoming Toy Fair 2018 in New York City. This event will take place at the Jacob K. Javitz Convention Center in Manhattan, NY and Bluefin will be at Booth #5331. The event will be hosted on February 17th-20th with free entry to the public. 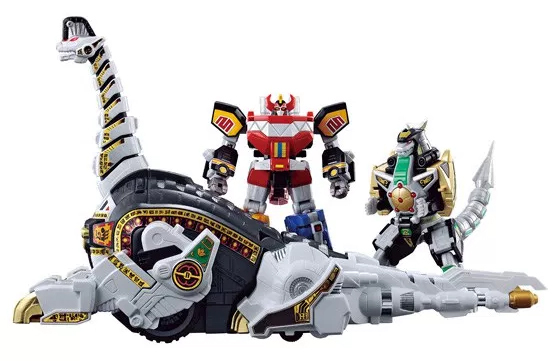 This year, Bluefin celebrates the 25th Anniversary of the launch of Mighty Morphin Power Rangers with the Shokugan Mini-Pla Titanus kit, to augment Megazord and Dragonzord Super Mini-Pla Kits, which are available now from leading retailers. Both releases are fully articulated and faithfully recreate the proportions and details from the original Mighty Morphin Power Rangers TV series. By combining all 5 Zords from the Megazord kits with the Dragonzord kit, fans can create the all-powerful Mega Dragonzord! Both kits can also be combined with the Titanus unit to form the Ultrazord – the ultimate Power Rangers robot. As the Super Mini-Pla name implies, these compact model kits offer simple pre-colored snap-together assembly. A nipper or sprue cutter (sold separately) is highly recommended for assembly, but the kits do not require glue. The New York City event marks one of the few instances of Bandai displaying new collectibles at a US-based show outside of Bluefin’s presence at events like SDCC and NYCC.